This text covers the entire neuroscience requirement of the pre-clinical medicine course in a logical series of double-page spreads. It recognizes the interdisciplinary nature of neuroscience, and the need to integrate students' knowledge of anatomy, biochemistry, physiology and pharmacology. Examples of the physiological systems of the central nervous system and its diseases are viewed from the molecular through to the behavioural level. 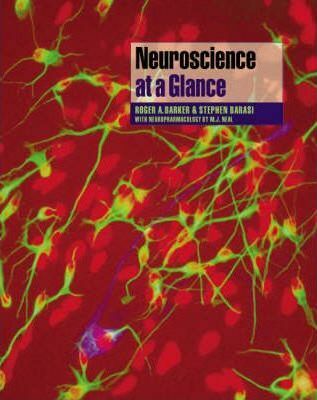 The text is logically divided into seven sections, starting with a general introduction entitled "Cellular Neurosciences" which covers the structure and function of the CNS at the microscopic level. The following sections cover cutaneous and visceral sensation, motor control and co-ordination of movement, the brainstem and special senses. Higher functions (memory, mood and cognition), and injury and ageing (dementias) are dealt with in the final sections. 1. The organisation of the nervous system; 2. Neurons; 3. Neuroglia; 4. Ion Channels; 5. The resting membrane and the action potential; 6. The neuromuscular junction 7. Receptors and receptor transduction; 8. Basic molecular neurobiology; 9. Techniques for studying CNS synapses; 10. Techniques for studying CNS function; 11. Embryology of the CNS; 12. Basic neuroanatomy; Part II: Information the brain needs to process: The sensory systems: 13. The organisation of sensory system; 14. The somatosenaory pathway; 15. Pain pathways; 16. The posterior parietal cortex; 17. The visual system - (i) Phototransduction; 18. The visual system - (ii) The retina; 19. The visual system - (iii) The visual pathways and the visual cortex; 20. The visual system - (iv) Extrastriate areas; 21. The auditory system (i) The cochlea and hair cell transduction; 22. The auditory system (ii) The auditory pathways and auditory cortex; 23. Olfaction; 24. Taste; 25. The vestibular system; 26. The thalamus; Part III: What the brain Does with that information: The Motor, Autonomic and Limbic Systems: 27. The organisation of motor systems; 28. Muscle and muscle contraction; 29. The muscle spindle; 30. The lower motor neuron and simple reflexes; 31. Spinal cord motor organisation; 32. Locomotion; 33. The cerebellum; 34. The motor cortex; 35. The secondary motor areas; 36. The prefrontal cortex; 37. The basal ganglia; 38. Eye movements; 39. The limbic system; 40. Long term potentiation and memory; 41. The hypothalamus and pituitary; 42. The autonomic nervous system; 43. The reticular formation and associated nuclei; Part IV: How the brain processes information: some general concepts: 44. The organisation of the cerebral cortex; 45. Modes of function of the cerebral cortex; 46. Nervous system plasticity (i) The peripheral nervous system; 47. Nervous system plasticity (ii) The central nervous system; 48. Neurotrophic factors; 49. CNS neurotransmitters and their pathways; 50. The neuropeptides; Further reading; Index.